You are here: Home › How To Make A Blog and a Blog Income › Who do you follow and trust so you become successful on-line? Who do you follow and trust so you become successful on-line? We are all followers, aren’t we? Especially in the on-line world. We are all looking for that ‘silver bullet’. The ‘silver bullet’ that will make us successful and each day we are bombarded by emails and adverts trying to sell us the latest buzz or hot topic. Ever fallen for one of those and it turns out to be just a re-hash of something else? But the advert promised it was easy. Yep, I have as well. Nowadays if I do sign up for a free report or free something and all I get is emails from the individual trying to sell me something else – I simply unsubscribe. Of course, I expect some sales type emails – we all have to earn a living and some of the products which are recommended can be good and worth buying…but not sales email after sales email please – especially when you haven’t even used the product yourself. But to be successful, especially on-line, I truly believe the quickest way is to follow someone who is already successful and who has already made the mistakes (so you don’t make them as well!). I follow only a few because they have credibility and I trust them. They aren’t always trying to sell you stuff either – they give good solid advice. So who am I willing to mention? Darren Rowse over at ProBlogger is a must. Then there is Terry Dean. Terry really helped me in my early days of starting an online business and I’ve followed him ever since. I subscribe to all their blog posts. Great title. It certainly caught my attention. I write lots of content and if I can make a sale every now and then, that would be wonderful. Never heard of this ‘guest posted’ Jimmy Brown! Wow, it’s a long article – over 2500 words. But I read every word. 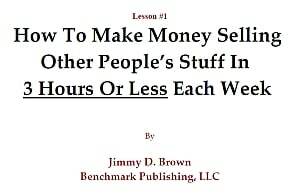 It’s a great article and it turns out good ol’ Jimmy is an affiliate master and Terry recommends him. Now I trust Terry but I go over to the Warrior forum and see if anyone has used Jimmy’s products before. When it comes to spending money – it’s worth getting a second opinion. I think it is anyway. Jimmy is getting great feedback from independent individuals. I like what I am seeing and reading. I go back to the sales page. It’s a membership. You pay a monthly fee and you get a weekly lesson. I like that approach rather than one big package and not knowing where to start. So I decide to sign up. I can always cancel if I don’t like it. So it’s Friday July 31st and I have my first lesson from Jimmy the affiliate master. Every Friday, I shall give you an update on my affiliate progress (without giving too many of Jimmy’s secrets away of course – that would be totally unethical). I’m now off to start this weeks assignment! Oh and tell me – who do you follow? How do you keep blogging when you are on holiday? 5 Responses to Who do you follow and trust so you become successful on-line? .-= David Stillwagon´s last blog ..Skeptics and Meniere’s Disease =-. I used to trust Yaro Starak. I am very sorry to realize that his “recommendations” are actually just thinly disguised affiliate marketing. This is the kiss of death if you wish to be seen an objective, unbiased teacher and advisor whose students are valued readers, rather than dormant “buyers” whose trust you secure to then later market to and cross-sell or upsell. Lately he has been repeatedly promoting programs in his blog and his e-mails from the likes of Maria Andros and from Andrew Short. No where in his writing is it evident that he has personally used either person’s products or services. Rather he suggests his readers act on their “resonance” with the sales promotions! I fear his desire for high affiliate commissions has clouded his judgment and he is beginning to abuse the trust he has previously worked hard to earn. I am very sorry to say I increasingly feel duped by Yaro. Us bloggers have got to make a living and, sometimes, we will add posts that are recommending affiliated products. I think the big difference, this time, with Yaro’s posts you are referring to, is that he trusts the individuals providing the products. One can always ignore such recommendations and read the other 99% of the blog posts that provide rock solid advice. I fully acknowledge that everyone needs to make living. I guess I just have an ethical dilemma which I would solve by full disclosure up front before making any recommendation of an affiliated product. That way the potential buyer understands the total picture. Your final suggestion is an excellent way to move forward. I haven’t had a problem w/Yaro’s promotions, he usually states when something is an affiliate promotion, and his policy pages pretty clearly spell out that he uses affiliate links any place they are available. If you are going to follow an internet marketing or business blog, then you have to expect that links are going to be affiliate links. Since Yaro provides useful information even when providing an affiliate link, this doesn’t bother me at all, and I will frequently search his site to see if he’s promoted a product I am thinking of buying so that he’ll get the commission. .-= Blaine Moore´s last blog ..TD Banknorth Beach to Beacon 10k (2009) =-.